The SCP solar powered centrifugal pool pumps with sensorless, brushless DC motors are the ultimate in performance and reliability. The CMP series features a 2” outlet. SCP series pool pumps will replace almost any AC powered pool pump up to 2 HP and because they get their power from the sun, you will never have an electric bill. The Sensorless Brushless DC Motors are the ultimate in efficiency, performance and reliability. Designed specifically for solar applications, these motors are less than half the size and weight of a conventional brush type motor and will provide years of trouble free service. SunPumps SCP series pumps can not only be used for pool water filtration, but for fountains, water features, pond aeration, circulating water for aqua culture or to irrigate small farms. They were designed for use as a stand-alone water delivery system. There is no better way to provide water for remote homes, villages, small farms as well as many other needs beyond commercial grid power. 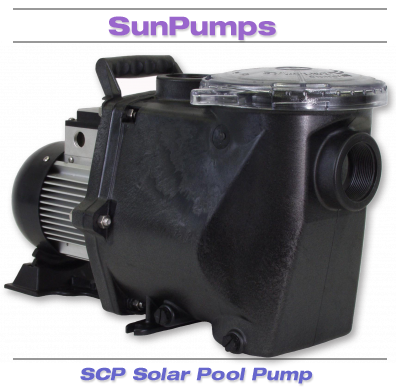 SunPumps high-quality manufacturing make the SCP series pumps the ultimate in solar powered pool pumps. 180 - Volts nominal operating voltage. The only application the controllers are designed for is the interface between a solar module array and SunPumps. The PCC-BLS series controllers are microprocessor based solid state DC power converters designed as the interface between a solar module array and a three phase brushless sensorless DC pump motor. The purpose of the controller is to operate the high efficiency, high reliability DC motor and maximize the total daily water output while providing protection for the pump as well as providing an interface with other related pumping system equipment. The SunPumps PCC-BLS-M2 series controllers were designed specifically for SunPumps three phase Sensorless Brushless DC motors. When properly installed and configured, the features incorporated into this stand-alone system will control and protect your pump system permitting many years of dependable, trouble free service. The PC series controllers will boost the current of solar modules in low sunlight conditions while holding the voltage of the solar modules at the maximum power point. This allows a pump to start much earlier in the morning and stay running longer in the evening.SunPumps PC series pump controllers have many unique features designed specifically for water pumping. • Current boosting for matching the load requirements of the pump. • Over-current protection via integrated electronic circuit breaker. • Voltage and current limiting to pump motor. • Transient protection and surge suppression. • Adjustable output motor power control for precision output flow. • Digital display indicating status, power, voltage, current and more. 5. Low Power, 6. Over-Current, 7. Fault Condition. • Rising clamp screw terminal blocks – no fork terminals required. • Pre-adjusted pump configuration and power source selection. Normally Open or Normally Closed, user selectable. Is this the right size pump for my pool? Quick Sizing - The quick sizing method is based on the volume of the pool in gallons and between 1 and 1.5 turn-overs per day. For example if you have a 20,000 gallon pool you want to size the pump for between 20,000 to 30,000 gallons per day. 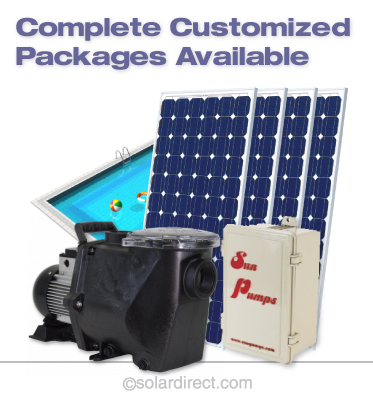 Complete Packages with Solar Pool Pump, Controller, and Solar Panels are also available. Please contact us with your pool size, pressure requirements and location of pool so that we can configure a kit especially for you.